There were no injuries in a two vehicle crash Friday afternoon in Century. The accident happened about 4:10 p.m. in the 8400 block of North Century Boulevard. Both drivers refused medical treatment. 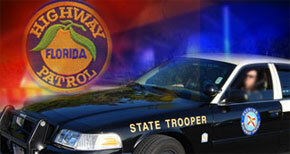 The accident is under investigation by the Florida Highway Patrol. NorthEscambia.com photos by Bethany Reynolds, click to enlarge. 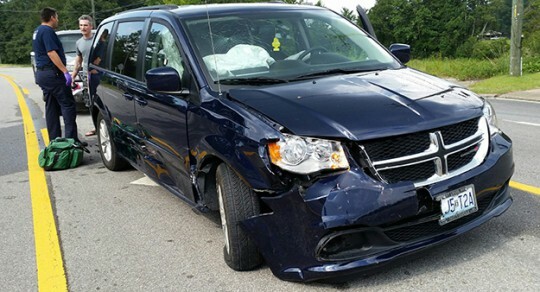 Editor’s note: The car had been moved from the accident location at the time of these photos. 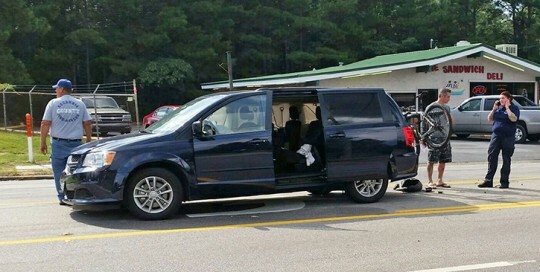 The Escambia County Sheriff’s Office is investigating an early morning shooting. About 1:15 a.m., deputies responded to a Shell gas station at Old Corry Field Road and Navy Boulevard for a reported shooting victim. 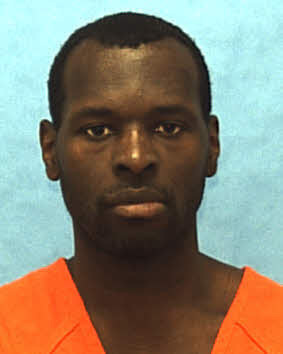 The victim, described by authorities only as a 34-year old black male, told deputies that he was shot during a drug transaction at the Moreno Court apartments on Old Corry Field Road. He was transported to a local hospital with non-life threatening injuries. There were no arrests reported. Free school supplies will be available to those in need this Saturday in Century. The supplies will be distributed in memory of Dedria Robinson, who was killed in 2005 in an automobile accident at age 11. Organizers of the “Dedria’s Gift” program said the school supplies are available to children from Escambia County in both Florida and Alabama. The giveaway begins at 10 a.m. Saturday in the Nadine McCaw Park (Roadside Park) on North Century Boulevard and continues until the school supplies are gone. Today: Scattered showers and thunderstorms. Partly sunny, with a high near 93. North wind 5 to 10 mph. Chance of precipitation is 50%. Tonight: A 20 percent chance of showers and thunderstorms before 1am. Partly cloudy, with a low around 72. Calm wind becoming north around 5 mph after midnight. Saturday: A 20 percent chance of showers and thunderstorms. Increasing clouds, with a high near 93. Calm wind becoming northeast around 5 mph in the morning. Saturday Night: A 20 percent chance of showers and thunderstorms. Partly cloudy, with a low around 70. South wind around 5 mph becoming calm in the evening. Sunday: A 30 percent chance of showers and thunderstorms. Mostly sunny, with a high near 95. Calm wind becoming southeast around 5 mph in the morning. Sunday Night: A 20 percent chance of showers and thunderstorms. Partly cloudy, with a low around 74. South wind around 5 mph becoming calm in the evening. Monday: A 30 percent chance of showers and thunderstorms. Partly sunny, with a high near 96. South wind around 5 mph. Monday Night: A 20 percent chance of showers and thunderstorms. Partly cloudy, with a low around 73. South wind around 5 mph becoming calm after midnight. Tuesday: A 20 percent chance of showers and thunderstorms. Mostly sunny, with a high near 93. Calm wind becoming south around 5 mph in the morning. Tuesday Night: Mostly cloudy, with a low around 74. Wednesday: A 20 percent chance of showers and thunderstorms. Partly sunny, with a high near 92. Wednesday Night: A 20 percent chance of showers and thunderstorms. Mostly cloudy, with a low around 73. Thursday: A 40 percent chance of showers and thunderstorms. Partly sunny, with a high near 92. 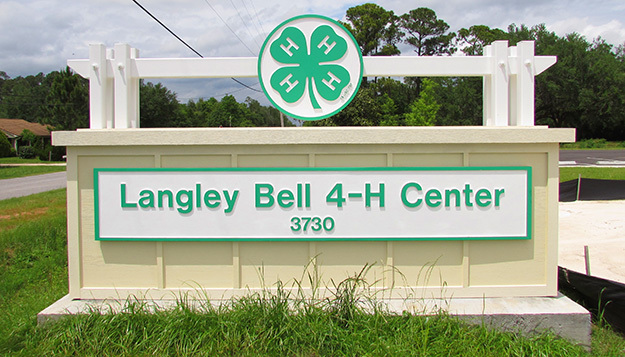 The new Langley Bell 4-H Center on Stefani Road in Cantonment has received an environmental and energy efficiency award. The center was awarded a Three Green Globes certificate. Green Globes is an online green building rating and certification tool that can be used for a wide range of commercial, institutional and multi-residential building types including offices, school, hospitals, hotels, academic and industrial facilities, warehouses, laboratories, sports facilities and multi-residential buildings. 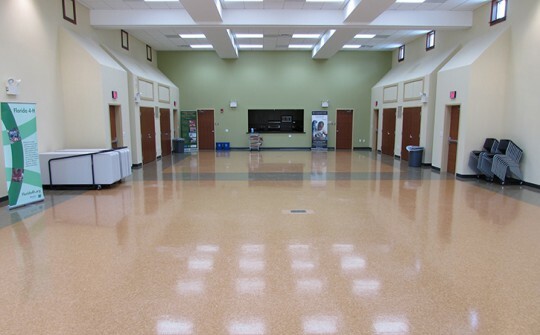 The building accomplished an overall rating of 70% demonstrating leadership in applying best practices regarding energy, water and environmental efficiency. Originally, this project was specified to receive only two Green Globes. However, the architect of record, Hernandez Calhoun, and the contractor, A. E. New, Jr., worked together with Escambia County to secure a higher level of certification with the guidance and support of the Green Globes assessor. .Pictured: The new Langley Bell 4-H Center on Stefani Road. NorthEscambia.com file photos, click to enlarge. Teachers unions and individual educators this week asked a federal appeals court to reconsider a decision upholding a controversial Florida law that tied teacher evaluations to student performance. A three-judge panel of the 11th U.S. Circuit Court of Appeals on July 7 upheld the 2011 law, dubbed the “Student Success Act.” The judges found that it did not violate constitutional rights for the state or a school district to base part of a teacher’s evaluation on tests that the teacher’s students took in other subjects or on tests taken by children not taught by that teacher. In 2013, the state passed a law aimed at making sure classroom teachers are only assessed based on the students they teach, but the appeals court said that didn’t make the lawsuit moot because the new law could still allow districts to approve similar policies. A vehicle found overturned in Century during the early morning hours of Wednesday was reported stolen a few hours later in Alabama. The overturned SUV was reported in the 8400 block of North Century Boulevard, near Burger King, about 1:20 a.m. Wednesday. First responders and law enforcement were unable to locate the driver of the vehicle following the crash. Several hours later, the vehicle’s owner awoke to find it gone and reported it stolen to the Flomaton Police Department, according to Flomaton Police Chief Bryan Davis. Anyone with information on the stolen vehicle is asked to contact the Flomaton Police Department at (251) 296-5811 or the Florida Highway Patrol at (850) 484-5000. OneBlood, Inc. which includes the local area blood bank, is merging effective July 31 with The Blood Alliance, Inc. The newly formed organization will distribute more than one million blood products annually, serve over 210 hospitals throughout most of Florida, parts of Georgia, Alabama and South Carolina and employ more than 2,400 people. “The landscape of the blood industry is rapidly changing and it demands that we continue to evolve and diversify to meet the needs of our hospital partners and their patients,” said Don Doddridge, President and Chief Executive Officer of OneBlood. “We are confident that the merger will have a positive impact in further defining the new template for the future of our industry and ensuring our communities have a progressive, forward-thinking local blood center that is here to serve for years to come,” said Doddridge. More stringent transfusion protocols, health care reform and advances in medical science are all helping shape a new era of blood banking. “Bringing the two organizations together is the right thing to do for our communities,” said Dr. Marsha Bertholf, Medical Director of The Blood Alliance. “We can no longer rely on the business models of the past to take us where we need to go in the future. Hospitals want larger scale blood centers to serve their multiple locations and the merger will allow us to accommodate their needs and still keep the hometown connection,” said Bertholf. In addition to mitigating cost to hospitals and patients, the merger is expected to bring additional operational efficiencies and further stabilize the blood supply, especially in times of natural disasters such as hurricanes and enhance donor outreach initiatives. OneBlood CEO, Don Doddridge, who began his blood banking career in Jacksonville, will lead the newly merged organization and an 11 member board of directors will provide oversight, governance and guidance. Integration of the two organizations will begin immediately. In addition, The Blood Alliance will undergo a rebranding phase in the coming months and transition to the OneBlood brand. OneBlood is a not-for-profit 501(c)(3) community asset responsible for providing safe, available and affordable blood to more than 200 hospital partners and their patients throughout most of Florida and into parts of southern Georgia and Alabama. Pictured: The OneBlood “Big Red Bus” at the Walnut Hill Volunteer Fire Department. NorthEscambia.com file photo, click to enlarge. The Pensacola Blue Wahoos (18-15, 43-57) were stymied at the plate in a 3-0 loss to the Chattanooga Lookouts (13-18, 56-43) Thursday night at AT&T Field. Wahoos starter Josh Smith (5-4) earned the loss despite a solid effort at the mound, throwing all eight innings and allowing three runs on eight hits. The game would be won by Chattanooga’s Jason Wheeler (2-2), who threw 8.0 shutout innings while only allowing three hits. J.T. Chargois would relieve him in the ninth to earn his eighth save of the season. Yovan Gonzalez, a player known more for his behind-the-plate prowess than his offensive ability, led Pensacola at the dish. He went 2-3 and was the only Wahoo with multiple hits on the evening. 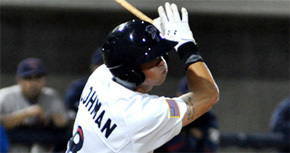 The Wahoos threatened in the top of the third as Juan Perez and Yovan Gonzalez opened the frame with a pair of singles. However, Wheeler retired three straight batters to keep avoid damage. The Lookouts got the scoring started in the bottom of the third as Aderlin Mejia was brought to the plate on a sacrifice fly from Heiker Meneses. They added another run on a solo blast over the right field wall from Max Kepler to make it 2-0. The Wahoos would load the bases with three consecutive two-out singles from Gonzalez, Amaral and Zach Vincej, but they were unable to capitalize as a grounder ended the frame. Before those hits, Wheeler had retired 17 straight Wahoo batters. Chattanooga added an insurance run in the bottom of the eighth with another solo home run for Kepler, this time on a line drive for his sixth of the season. Smith had retired 10 straight before the homer. In the ninth, the Wahoos put two men on with a Marquez Smith walk and a Sean Buckley single, but the Wahoos came up empty once again. The scoreless effort marked the first time that the Wahoos had been shut out since a 1-0 defeat in Mississippi on June 26th. Seth Mejias-Brean did not reach base for the Wahoos, bringing an end to a streak of 23 consecutive road games.